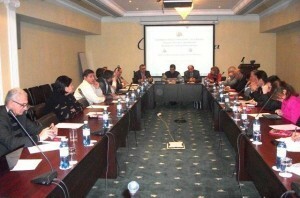 On January 27, 2012 Center for National and International Studies held in Caspian Plaza,Baku a conference on “Azerbaijani-Turkish relations in a changing geopolitical context”. In her opening speech Leila Aliyeva, the President of the Center for National and International Studies, emphasized that “not only cultural and ethnic relations are the basis of the bilateral relations between Azerbaijan and Turkey”. According to Leila Alieva, “the fundamental principles of these relations are political factors”. Turkish expert Professor of the Qazi University Dr. Mehmet Seyfettin Erol proposed “to develop a “road map” of joint actions between Turkey and Azerbaijan on the international arena. Such interaction is important in the light of the “factor of 2015” , notably the 100th anniversary of the historical events in 1915. “Today, Caucasus is a main bridge for Turkey towards Russia and Central Asia. Turkey and Azerbaijan have faced one and the same problem. For Turkey, this is the “Armenian question», and for Azerbaijan it is the Nagorno-Karabakh conflict. However, in fact, it is not simply Armenia who opposes Turkey and Azerbaijan, the world’s power centers are also behind it”- noticed the Turkish Professor. Dr. Elkhan Mehdiyev, Head of the Peace Research Center, began his speech with sharp criticism of both Azerbaijani and Turkish elites. Beginning from the history of bilateral relations, Dr. Elkhan Mehdiyev stressed, that “in recent years more and more of these relationships based on economic and energy cooperation”. “Unfortunately, we don’t observe any cooperation on the political level. Azerbaijan doesn’t inform the Turkish colleagues about the status of the negotiations on Nagorno-Karabakh conflict. To my mind, for these reasons Turkey started negotiations about the opening of borders with Armenia. After the decision of the French Senate, the official statement of the Azerbaijani Ministry of Foreign was sounded similar to the official statement of “the Ministry of Foreign Affairs of Mauritania”, – Elkhan Mehdiyev stressed. On the other hand, Turkey herself has not been politically pro-active in regards Nagorno-Karabakh conflict at the international level and the importance of this problem seems not to be so great for Turkish elites. Only once – in Munich Economic Forum, Erdogan stated officially, that “the Turkish-Armenian relations can develop after the liberation of the occupied territories of Azerbaijan”. Azerbaijani expert Sabit Baghirov made a report on the economic relations between the two countries, and noted that despite some problems, both countries successfully cooperate in the energy sphere. “Of course, this is normal. However, we shouldn’t forget the relations between our peoples. There are many problems between the two states in labor, insurance, social assistance and other areas, as there is no single market, or free economic zones. How could the European Union’s 27 countries to ensure 4 freedoms – free movement of goods, capital, services and people- between themselves, while we, two states only, did not manage it yet?” – stressed Sabit Baghirov. He praised the agreement on the construction of the Trans-Caspian gas pipeline, which will become part of the Southern energy corridor and a contribution to the European energy security. Closing the conference, Leyla Aliyeva noted that “today, the relations between Azerbaijan and Turkey are not on the level, which was 100 years ago, during the Azerbaijan Democratic Republic. Unfortunately, the integration doesn’t develop on the basis of values. The relationships develop mainly at the ruling elite’s level, but not at the level of communities and people. Official Ankara, unlike the US or EU, does not support democracy development in Azerbaijan, apparently fearing to undermine cooperation in energy. I believe that our relations with Turkey must be different from the relations with Russia, Iran and other countries. And I’m sure it will be so” – stressed Dr. Leila Aliyeva.